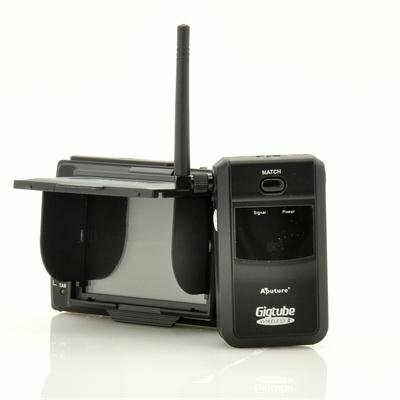 Successfully Added 3.5 Inch Wireless Live View LCD Camera Display "Aputure Gigtube II" - for Nikon DSLR to your Shopping Cart. 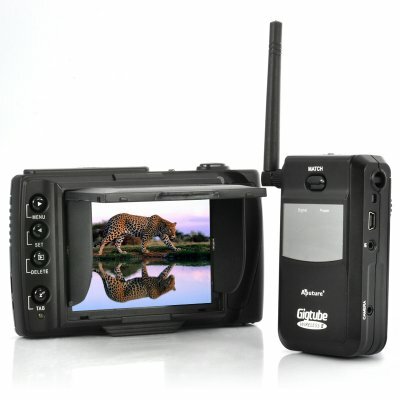 3.5 Inch wireless display and remote for Nikon DSLR camera which is ideal for professional and amateurs photographers to wirelessly take and view photos or videos in studio or outside. Compatible with Nikon DSLR cameras such as; Nikon D3X, D3S, D3, D300S, D7000, D90, D3100, this professional 3.5 Inch TFT LCD wireless live view camera display remote can View up to 4 different images through 4 different cameras, using 4 separate 2.4Ghz receivers purchased separately. This 2.4Ghz anti-interference wireless digital transmission signal will transmit a clear image up to 100 meters and will store up to 100 pictures within its built in memory. In addition this live view remote control features; live viewfinding functions; video start and stop capabilities; photograph view functions and comes with a sun visor for those bright days! This product is ideal for any professional photographer or anyone with a DSLR Nikon camera, looking to purchase a great accessory or use these functions professionally. At a low wholesale price this item is perfect for the resale market and is provided direct to you by the world number one choice for the latest high-tech gadgets and budget-friendly prices: Chinavasion. "Nikon", and all models listed in this descriptions are trademarks of Nikon Inc., registered in the U.S. and other countries. This and other similar products are not claimed to be an authorized or branded product by Nikon Inc. These products and our company are not affiliated with Nikon Inc. or endorsed by them in any way. Our products are unbranded / white box and are sourced with full respect for Intellectual Property Rights - you will never be sold a fake brand or misrepresented product by Chinavasion.com.